Chinese cuisine is incredibly varied, thanks to its wide geography and subcultures. 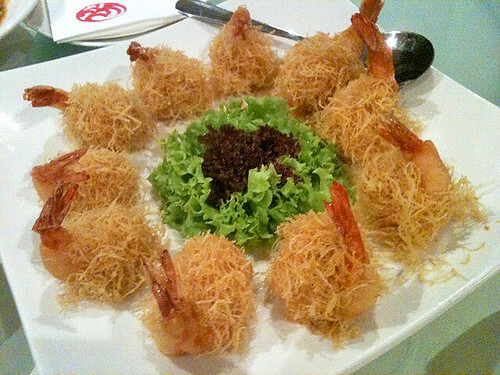 However, the majority of Chinese restaurants in Singapore is of the Cantonese variety. So when we see a new Chinese restaurant popping up, it's hard to get excited...unless it's offering something really quite different. Enter "Duo Le" at Orchard Central, the first Shaanxi fine-dining restaurant to set up locally. Talk about exotic (for me, anyway). Before this, I could not even point to where Shaanxi was on China's map. Somewhere vaguely in the middle, was all I knew. Shaanxi (陕西) province is not to be confused with neighbouring Shanxi (山西). Shaanxi is where you will find historical Xi'An, which is its capital city and home to the famous Qin Dynasty terracotta warriors. 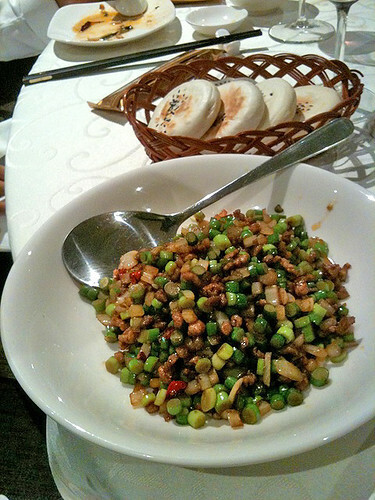 Not surprisingly, Shaanxi cuisine is also called Qin cuisine. With such rich history spanning various dynasties, Shaanxi cooking offers diverse tastes with styles adapted from many ancient styles. A Shaanxi meal often comprises several cold dishes followed by hot dishes (Duo Le's menu is largely divided into cold and hot dishes). We learned from owner Eric Yang that folks in Shaanxi like to take their time savouring their food, and it's not unusual to see dinner stretching into three hours. That is the life! I liked many items from the cold selections. 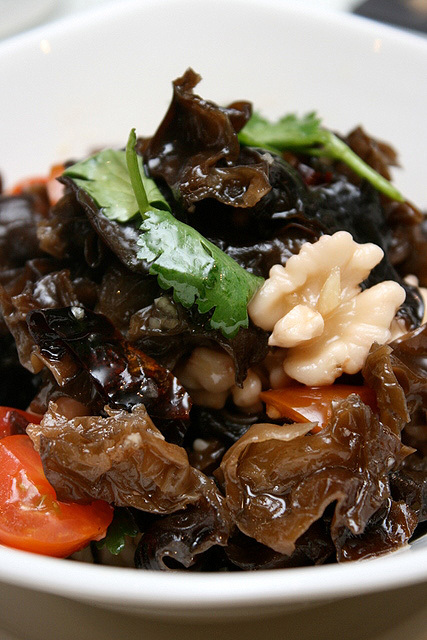 The walnut kernels with black fungus are refreshing. These pristine white-fleshed walnuts are specially imported from Shaanxi. 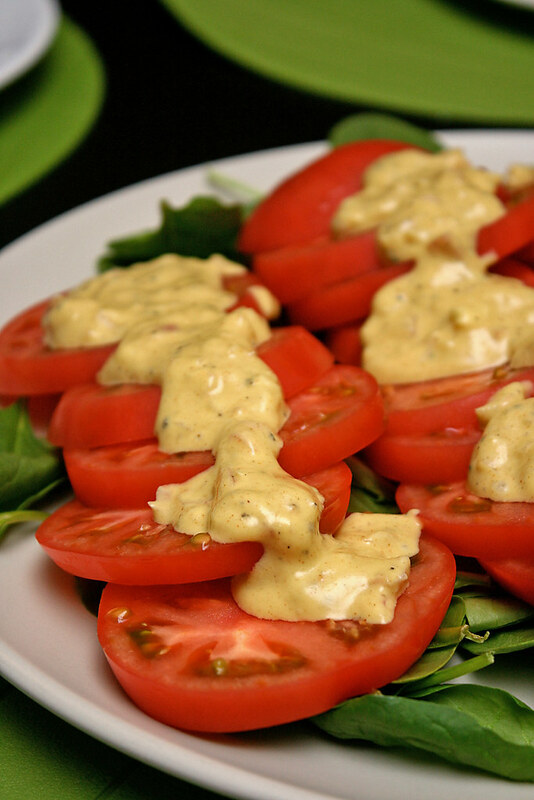 The dressing is gently salty, spicy, sweet and sour - it energises all your tastebuds at once. 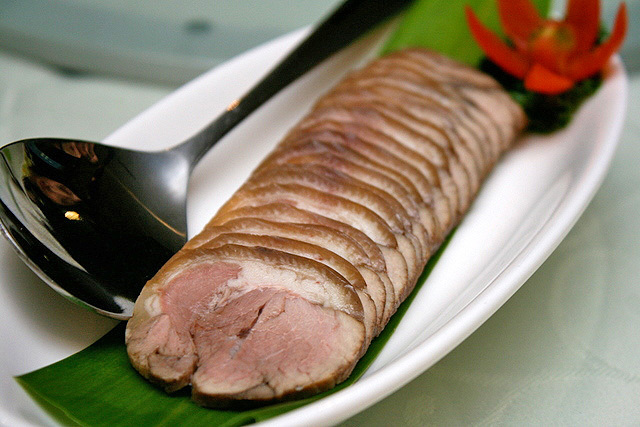 Pork is the most common meat used in Shaanxi cuisine. 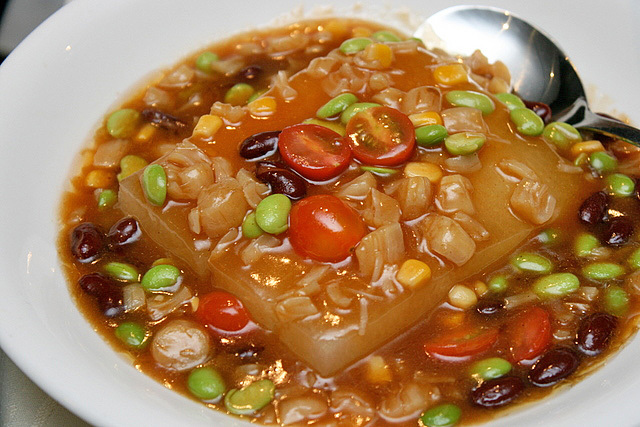 This is Duo Le's secret recipe pig's knuckle, which is served cold and resembles a terrine. I'm not sure if this is Shaanxi in nature, but Duo Le does some amazing tricks with vegetables. Here's fresh celery with homemade seasoning. I don't know how they cured it, but the celery is completely rid of its obnoxiously fibrous and vegetal quality. It's crisp, refreshing and tastes like celery should! Noodles also feature more than rice in this Northwestern province. I read that Shaanxi noodles are typically wider, longer and thicker than their Beijing counterparts. You can also add "chewier". These handmade noodles have a certain QQ quality, thanks to a unique noodle-making method. 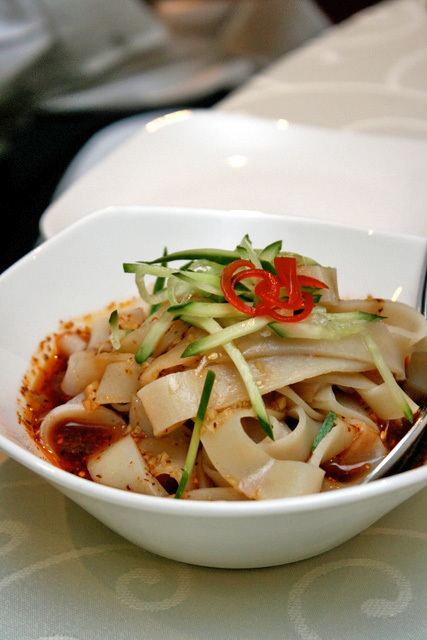 Shaanxi natives like Eric are especially particular about the texture of these noodles. 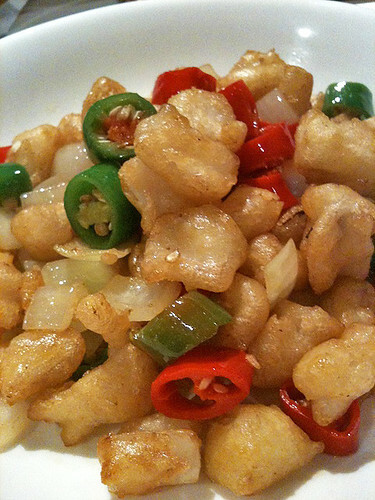 Shaanxi cuisine leans more towards the strong and savoury - salt, garlic, onions, chillies and vinegar dominate. And because Shaanxi is situated between Shanxi and Sichuan, there are natural influences from both regions (sour and spicy respectively). 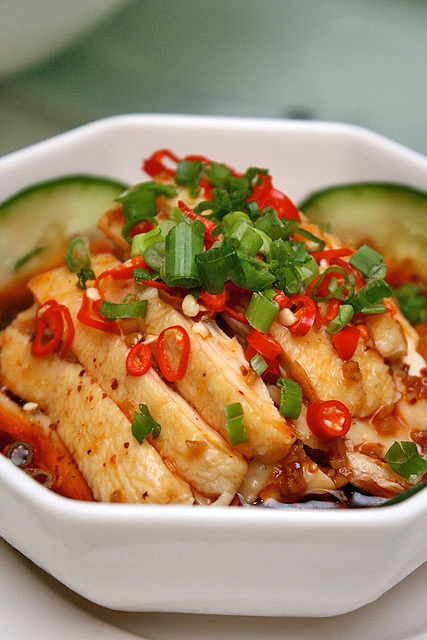 This dish above of boiled sliced chicken and cucumber with homemade chili oil is similar to the Sichuan version. It's served cold, and is quite good. 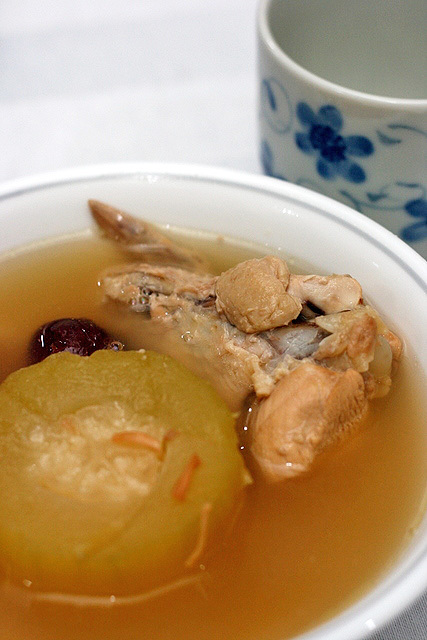 The hot dishes continued with "Dry scallop stew with winter melon". 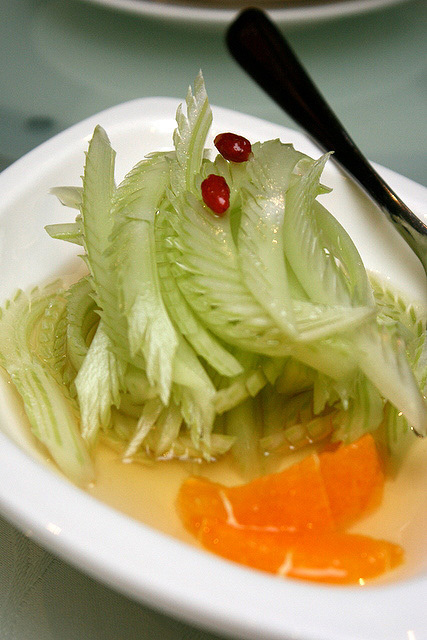 Winter melon always has this homely taste to it. The warm and soft flesh is comforting and clean-tasting, but best taken with a dollop of scallop for flavour. Now this is an unusual and possibly modern invention. We were asked to guess what it was, and no one got it. Seafood mashed potatoes. It certainly isn't anything like the Western mashed potatoes. This was much more dense and gummy. 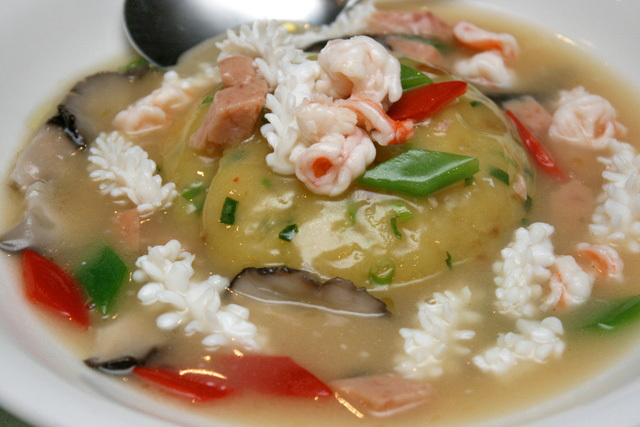 The seafood broth was nice though. 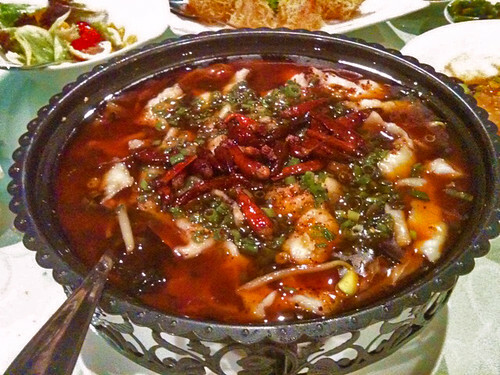 "Sichuan chili oil and dried chili with sliced fish" is similar to Sichuan's "Shui Zu Yu" or "water-boiled fish". Oh, it looks deadly but it's not as fiery as it looks. Still, your tongue will tingle after a while as the heat sets in. Sorry for the grainy photo, but this and the ones below were taken with an iPhone. My DSLR camera ran out of juice at this point in time (utterly unthinkable and unforgiveable!). But I must show you the rest of the dishes! We were also asked to take a gander at what this dish was. Can you guess by looking at it? This one I recognised the minute I popped it into my mouth. 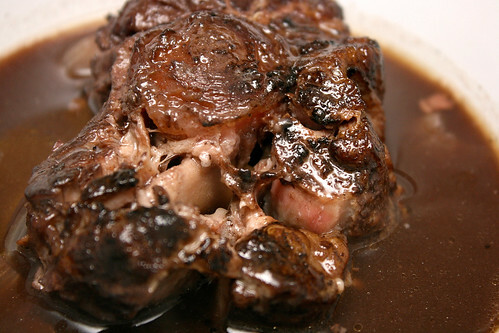 It's what the Japanese call "nankotsu" or the cartilage in the chicken breastbone - one of my favourite items. The "special flavour chicken gristle" was well-seasoned and crunchy with moist bits of chicken flesh. This was better than popcorn chicken. Eric says they try to keep cuisine at Duo Le as authentic as possible, with minimal adjustments to suit local palates (less oil and salt). Duo Le does also borrow a little from Cantonese cuisine for some dishes, so those who are not used to Shaanxi cuisine can take comfort in something familiar. 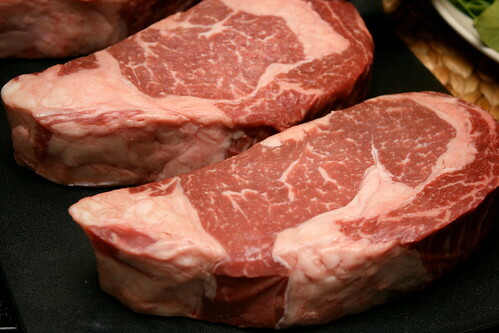 What they do not compromise on is freshness and quality. Each dish is prepared a la minute (even the chopping of ingredients), so there's some waiting time involved. For example, the "Special Shaanxi marinated meat in baked pancake" above. These signature snacks are each prepared and baked only upon order, so you'll need to wait for about 20 minutes. 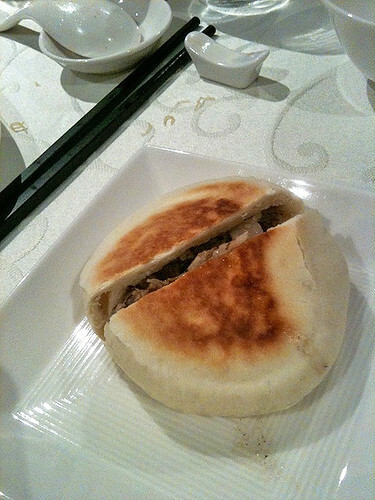 The buns are soft yet flaky, a good canvas for the strong-flavoured meat. Incidentally, the buns are baked separately and the meat is stuffed inside only afterwards. Normally the bun is sliced horizontally but here it's halved in the centre. There is another version which tends to be more popular with women - spicy tenderloin, served with pancakes. Maybe it's the vegetables. I can't decide which one I prefer. One's hearty and meaty, the other is spicy and crunchy. Deep-fried prawn wrapped with homemade sauce and potatoes. Where are the potatoes? Try looking again. They're the finely shredded bits coating the prawns. Tiniest fries ever! And these are all hand-sliced! Amazing knife skills! Plus the chefs get to slicing the potatoes only upon order. There is no pre-prepared pile of potato filigree in the kitchen. We rounded off the evening with fresh fruits and little bowls of Chinese red dates. These are incredibly fragrant and sweet, almost ambrosial. 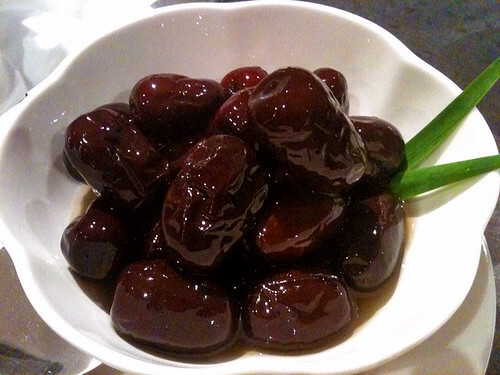 Red dates are also believed to be good for promoting blood circulation. Eric says if you eat these regularly, you will have rosy cheeks! I learnt a lot from this dinner and am charmed by the restaurant's name. "Duo Le" translates to mean "much joy/happiness", which is aptly what food should bring, especially when enjoyed with family and loved ones. 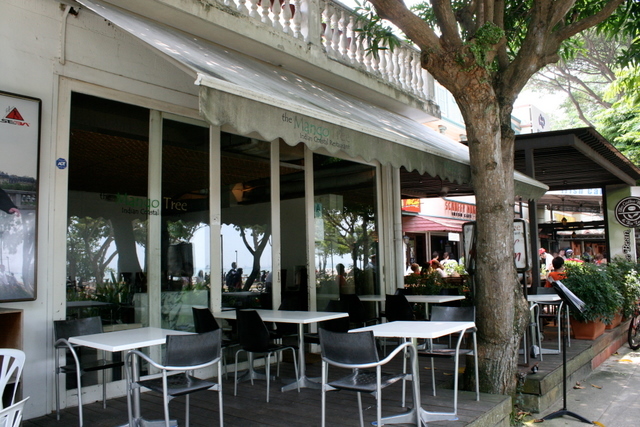 The restaurant is the first overseas venture, and the third in a successful chain in China. I'm glad they're bringing more variety to the Chinese dining scene in Singapore. Warmest thanks to Fenix for arranging this dinner, and to Natalie of the Far East Group and Eric of Duo Le for being such wonderful hosts. Check out Ladyironchef and Miss Glitzy for their reviews. P.S. Duo Le is now having buffet lunch and dinner Mondays to Wednesdays for S$19.99++ and daily High Tea for just S$6.99++ (pdf of the menu items here). Check out their CNY menus on their website too. I think many of us have been eating Glico products since we were kids. Now there are so many flavours. 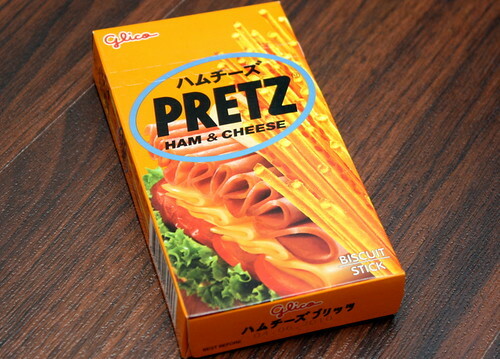 Glico Pretz: Ham & Cheese flavour is my current favourite out of all the many available. It's really addictive! I still prefer the savoury flavours of these Pretz biscuits to the sweet Pocky ones. What's your favourite flavour? Of course, the ones made in Japan are totally unbeatable. Once in a while, a nice treat. 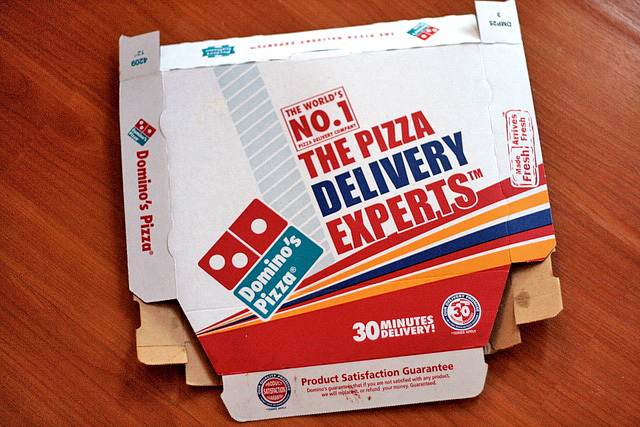 I have found my all-time favourite delivery pizza and it's Domino's! They're back after about a decade's hiatus. 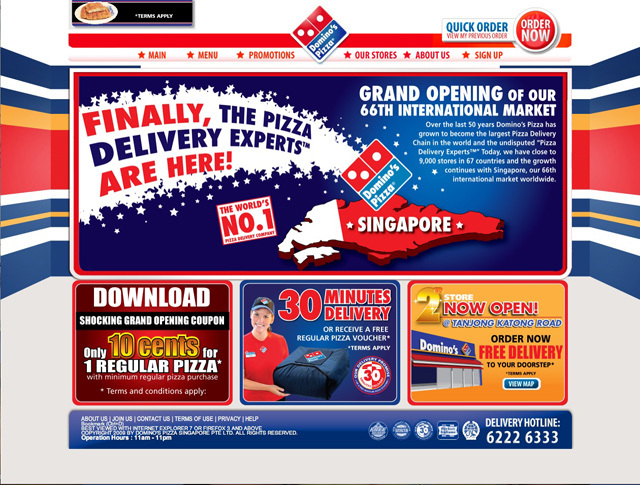 Singapore now has many delivery pizzas but none too outstanding. My family has, out of curiosity, tried everything out there on the market. 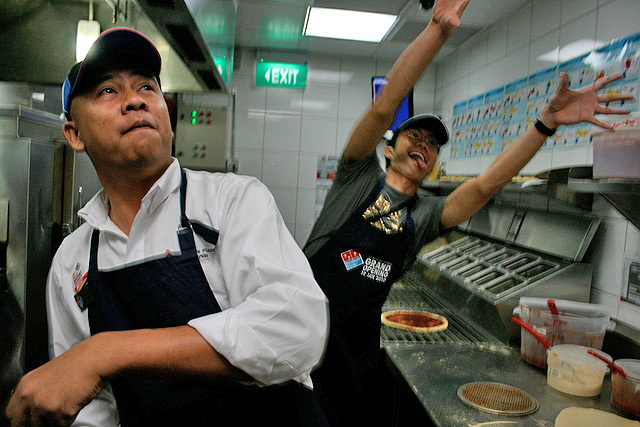 Domino's is pretty good for a delivery pizza. PLUS, it comes to you in 30 minutes or less (it's their guarantee)! Ours arrived sizzling hot just 25 minutes after I completed my order online. How do you beat that? Hubby and I were very happy to see their flyer show up at our home. He's very well acquainted with their product, having consumed copious quantities of it while he was working in KL. 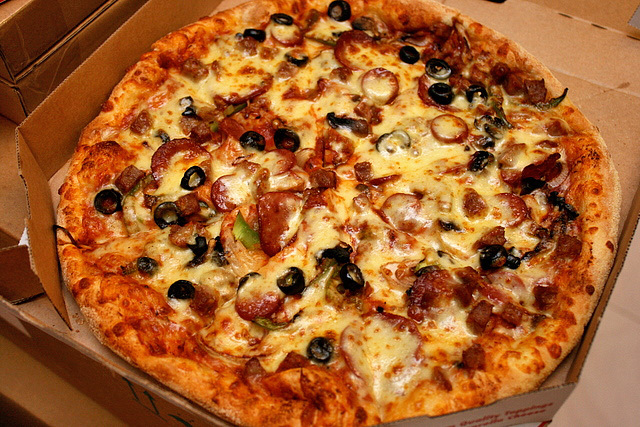 This is their Extravaganzza pizza with their Classic Hand-Tossed Crust. Nice and chewy and not overly thick. 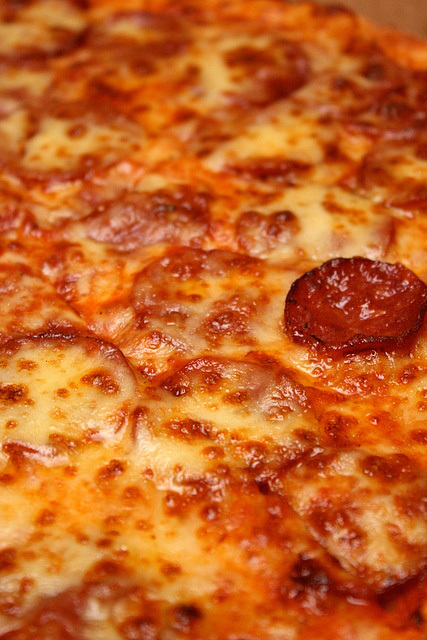 Unlike many pizzas, the crust is NOT clogged with oil as the pizza is baked on an oil-free screen. Clever. 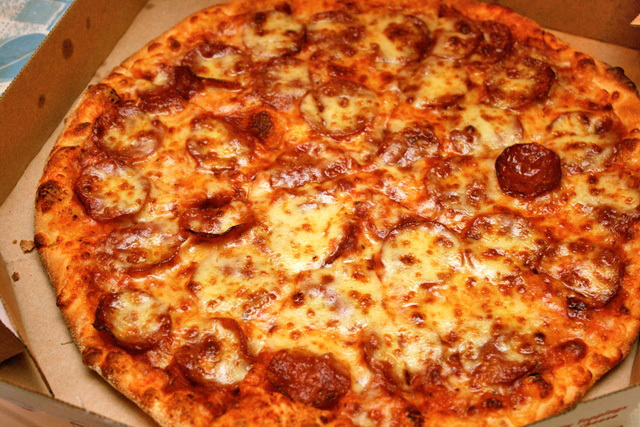 Here's their pepperoni pizza with New York crust (first photo is a close-up of this). This crust is also hand-stretched, and is thinner than the classic version. There's also a Crunchy Thin crust. Both the pizzas had generous toppings, and the value deal came with extra mozzarella (they use 100% mozzarella for all pizzas). You get free Cinnastix when you order online. 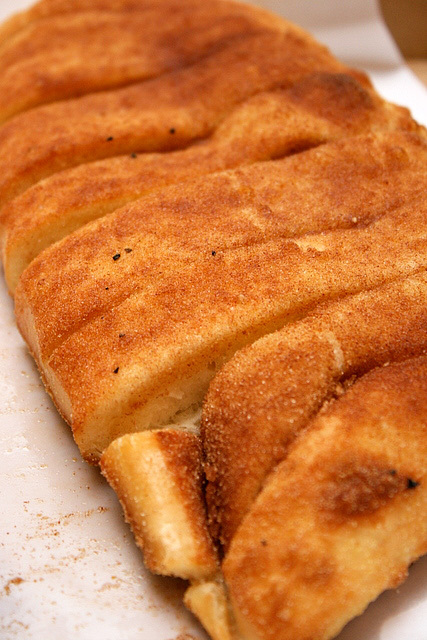 These are soft, fluffy breadsticks sprinkled with cinnamon and sugar. They also come with a packet of icing, if you really want to indulge that sweet tooth! What I also like is that their packaging is designed to be easily flattened after use - makes for easy disposal! If you've ever tried shoving pizza boxes down the rubbish chute...well, you'll know what I mean. 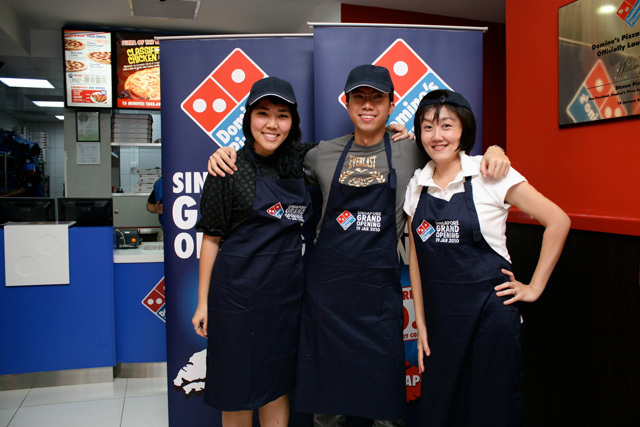 Domino's held their official launch a couple days later at their Tanjong Katong branch. At the blogger event, Cheryl, LeRoy and I (above) got to meet the management and operations team behind Domino's who shared their plans for Singapore. Right now there are two outlets at Katong and Bukit Timah, which serve customers that are within a ten-minute drive time radius (see below for map and coverage description). They intend to cover the whole of Singapore by year end with at least 9-10 outlets. We also learnt how to assess a pizza (the bake, portion and placement - hope I got that right). They are pretty fastidious about what makes a good pizza. Even the base has to be evenly browned. I guess they have to be quality-conscious, as they have a product satisfaction guarantee. We even got the chance to try our hands at pizza making! It's addictive, trying to get it right. Stretching the dough is not as easy as they make it look! "Handle it with love!" says our trainer. So that's their secret! We also got up to shenanigans in the kitchen. Dramatic tricks like pizza dough back throws! Sorry the pizza flew so high, it's out of the frame! Of course we got to try many pizza flavours too. 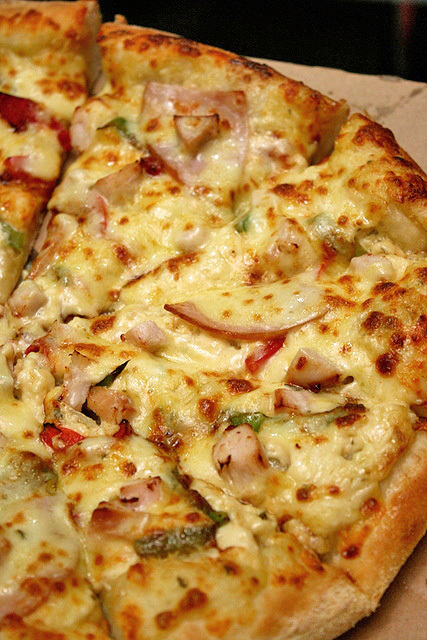 This is the Chicken Temptation pizza - mozzarella cheese, smoked chicken breast, turkey ham, green pepper and red pepper. 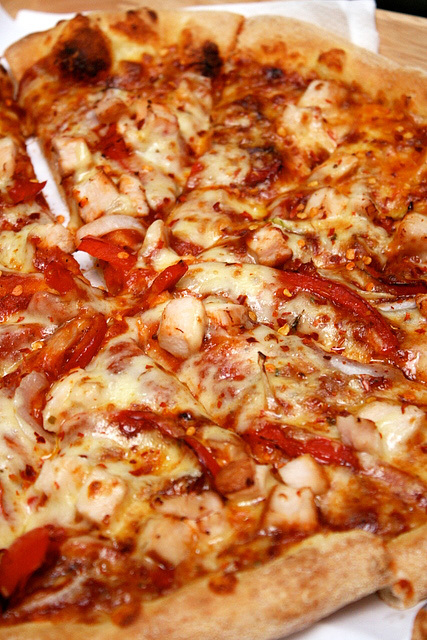 Chili chicken pizza - smoked chicken breast, onion, red pepper, red chili flakes. Looks more deadly than it is. It's the only one with the sweet and spicy sauce base, but it's not too spicy. 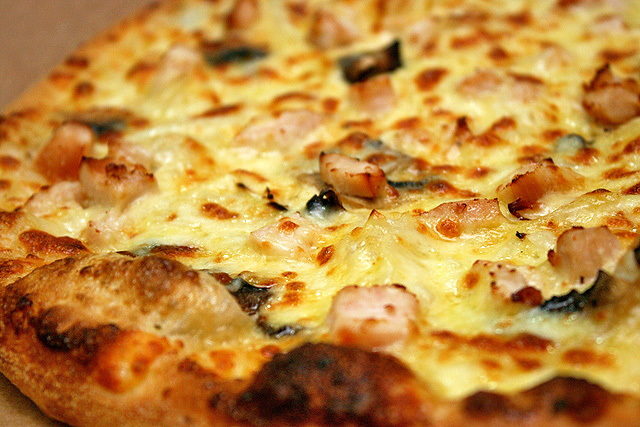 Classified Chicken - mozzarella cheese, smoked chicken breast, onion and mushroom - is one of two with their Top Secret Sauce. It's a creamy and cheesy white sauce with a hint of garlic. I'm having this next time, love the sauce! 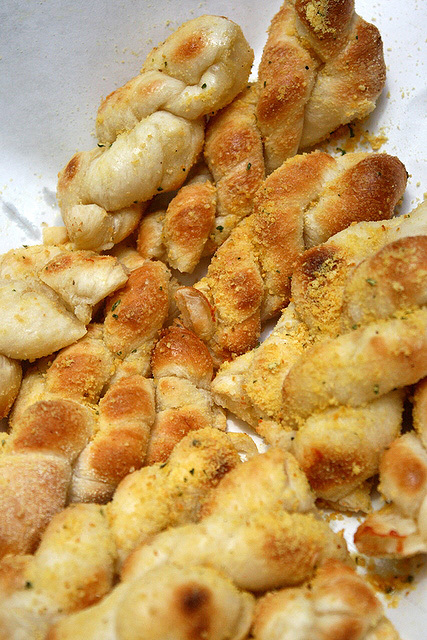 The Twisty Bread is literally garlic bread with a twist! The seasoning even tastes like Twisties! I really like their onion rings too - even the cold one I had tasted good! Right now there is an opening deal - a regular pizza for just 10 cents with every order of a regular (or larger) pizza - valid from now til Feb 28, 2010. Order by phone (6222-6333), website or in person at their store (there's a 15-minute guarantee for takeaways). There are also lots of value meal deals. Check out the website, it's bright, cheery and easy to use. Payment is by cash only for now. 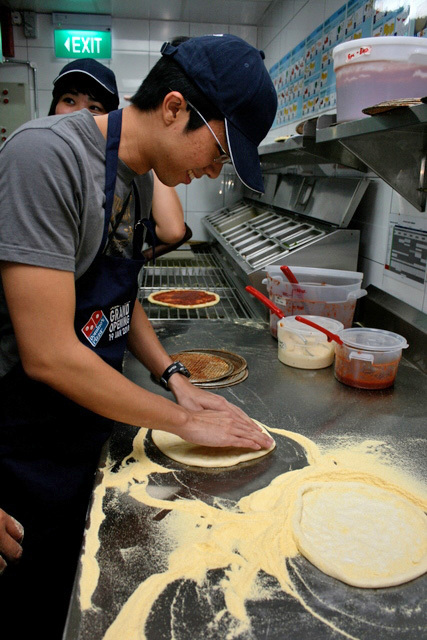 Domino's is also certified halal, and products with beef are flagged for those who prefer not to take beef. Pricing is all inclusive of GST, ERP and delivery (no added extras to inflate the final cost). The Bukit Timah branch covers areas like Bukit Timah Road, Bukit Batok Road, Bukit Batok East Avenue, Bukit Batok West Avenue, Hillview Avenue, Chestnut Avenue, Old Jurong Road, Jalan Jurong Kechil, Bukit Panjang, Clementi, Holland Village, Jurong East, Toh Guan and Toh Tuck. The Katong branch serves Marine Parade, Tanjong Rhu, Siglap Road, Joo Chiat Road, Eunos Road, Telok Kurau, Mountbatten Road, Bedok Reservoir, Geylang East and Ubi. I'd seen many mouthwatering shots of Julia's homecooking on her blog Aromacookery. They always look more enticing than many restaurant dishes. Finally, I had a chance to try her cooking! She invited a lucky few of us over for dinner - Keropokman and Momo, HungryCow, and Derrick. 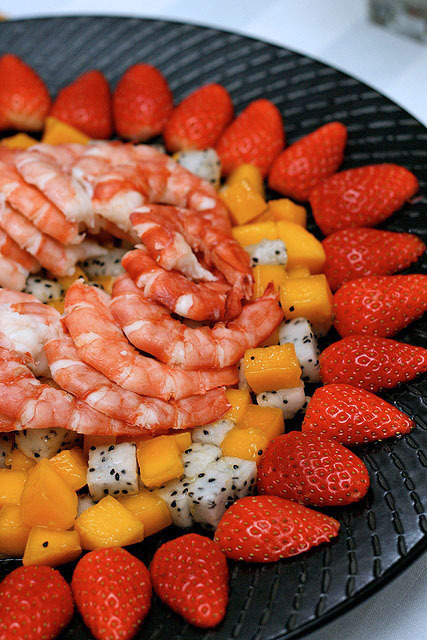 First up was a gorgeous prawn salad with mango, strawberries and dragonfruit, drizzled with a special Thai sauce. 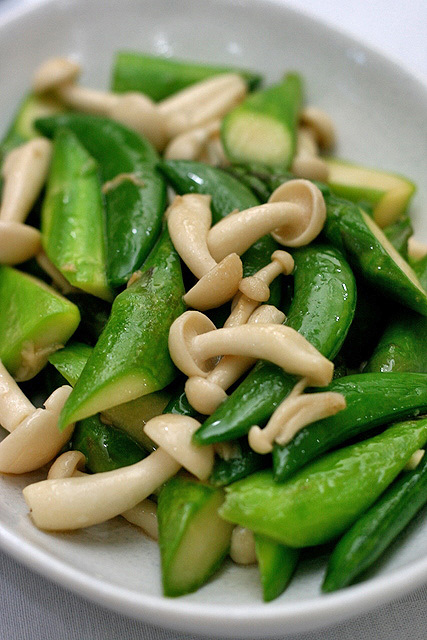 The vegetables are a lovely medley of asparagus, sugar snap peas and white shimeji mushrooms. Pre-blanching ensured the greens stayed crisp. 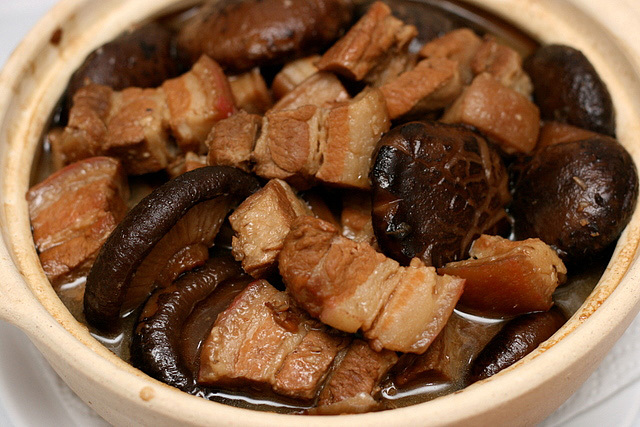 Possibly my favourite dish - beautiful stewed pork belly with mushrooms in claypot! You just want to keep taking more...we polished it all off in no time. The gravy is great with rice. 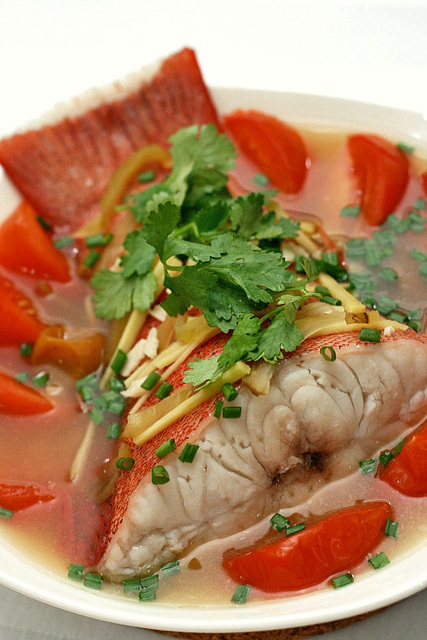 Steamed fish, Teochew style, with preserved vegetables, ginger and tomatoes. The lightly salty and tangy broth is very appetising. Finally we had chicken soup to round up the meal. There were lots of goodies in it - old cucumber hairy gourd, dried scallop, red dates, bitter almonds. Look at how rich the soup is! Thank you, Julia, for that wonderful meal. We all stayed and chatted til midnight. It was a lot more fun and relaxing than going to a restaurant! And yes, we all think Ricky is a super lucky husband! It's a busy, busy start to the new year. I'm shuttling between unfinished kitchen and hospital (mum-in-law is very ill). But one thing we must never neglect is good food! You lose interest in food, you lose interest in life! Today I'm posting something from last year. An oldie but goodie. The Mango Tree with its coastal Indian cuisine is possibly one of the best restaurants at Marine Cove. What we also love about it is that it still has the air of a quiet, hidden gem amidst the bustling East Coast beachfront. 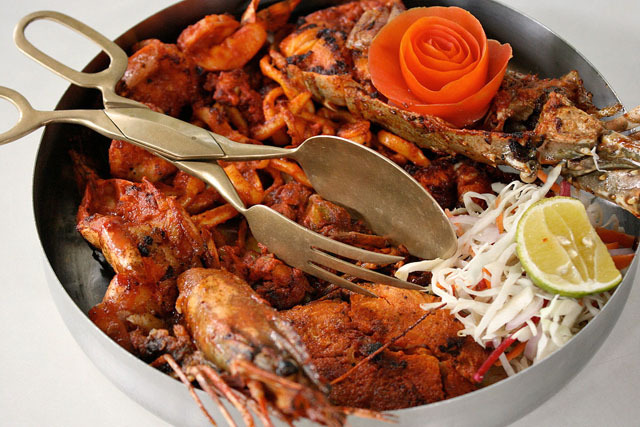 If you feel like splurging, go for the Malabar Seafood Platter (S$55) - a luxurious array of tiger prawn, fish, squid, lobster and soft shell crab, pan seared with Kerala marinade. Looks absolutely gorgeous. There's enough for 3-4 persons to share - and it's possibly wise to do so, as the same marinade across different seafood can prove a little tongue-numbing after a while. 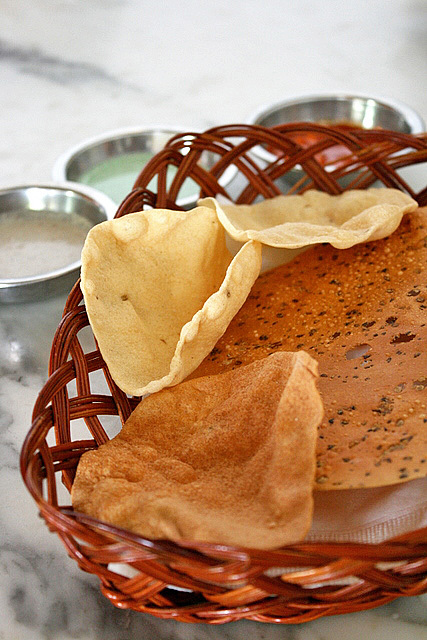 The complimentary papadum is always a nice touch. The kids love this so much, we always need extra helpings. 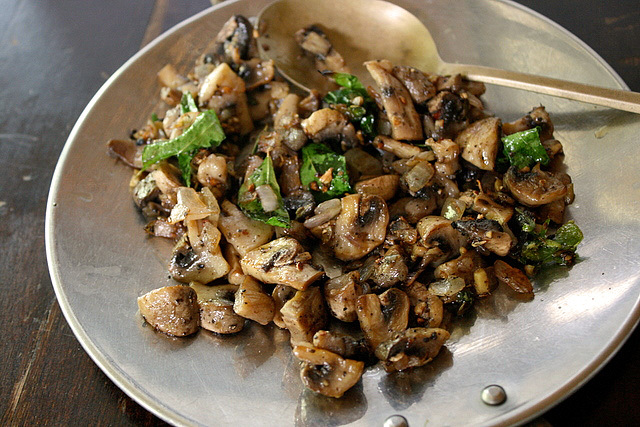 Mushroom Pepper Fry (S$7.90) - Sauteed mushroom with pepper and onion. Another one of my favourite dishes. So simple yet so delicious. I love the elegant and understated decor. 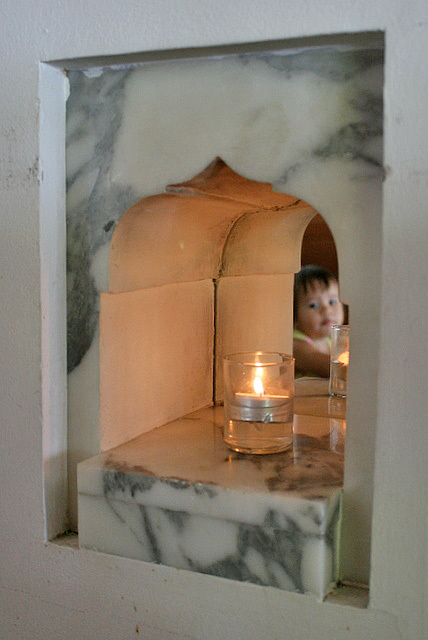 The little marble alcoves are almost like tealight shrines. There are also ornately carved wooden pillars that look like they were from a beautiful ancient palace or temple. Mussel Masala (S$5.90, listed under Appetiser but portion is generous enough to be a main!) in thick coriander and onion gravy. This one tastes slightly different from when I last had it. The spices seem thicker and the seafood flavour is less intense. Still love it. 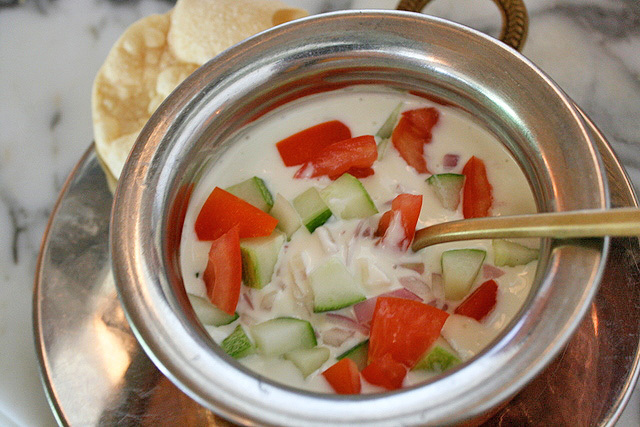 Raita (S$4.50) is always a great palate cleanser. The cucumber and onions in tangy yoghurt are incredibly refreshing, and the firm tomatoes add a dash of colour. 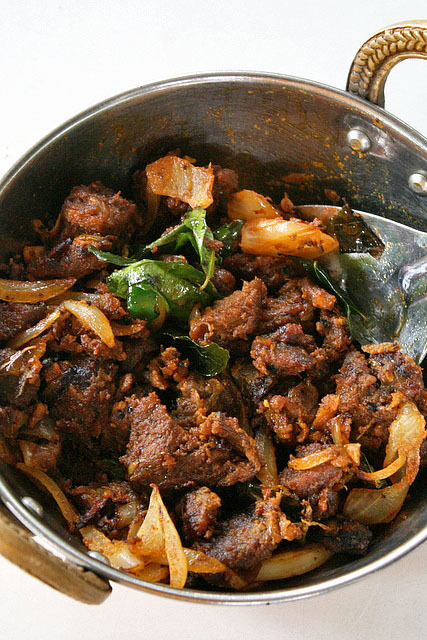 Erachi Ularthiyathu (S$14) - Tender mutton roasted with garam masala and diced coconut. We always, always, always have this when we come here. 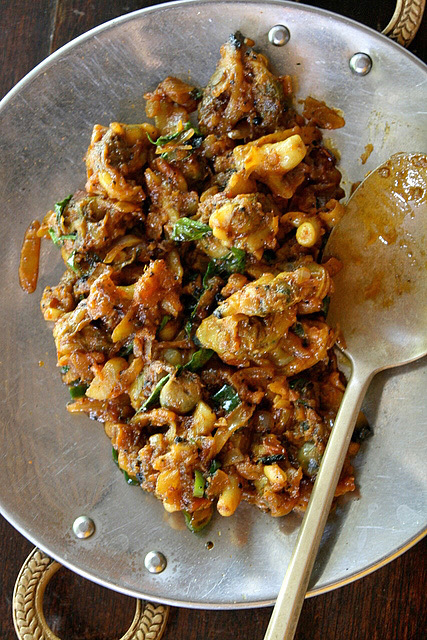 This dish will convert even the most die-hard of mutton haters. Sometimes simple rice done right can be such a treat. 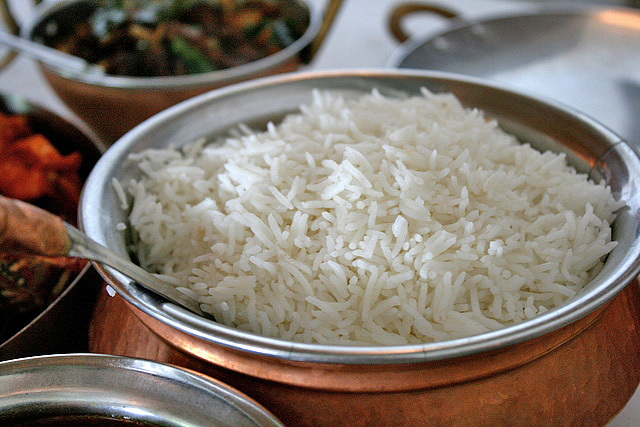 White, fluffy basmati is so good with the rich curries and dishes. Drinks here are fairly expensive. 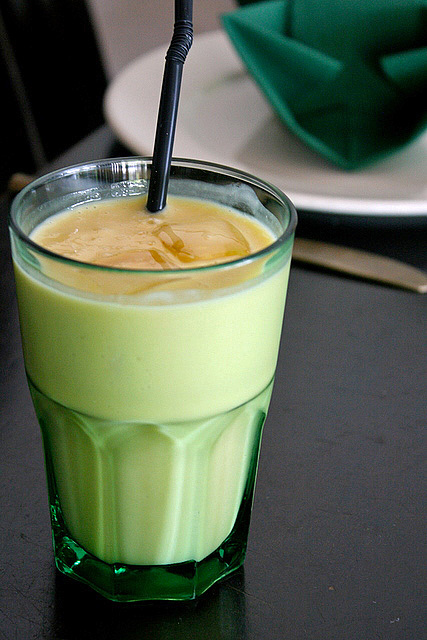 The mango lassi is S$7++. But at least it's thick and luscious. The Mango Tree is named for the literal tree outside the restaurant. 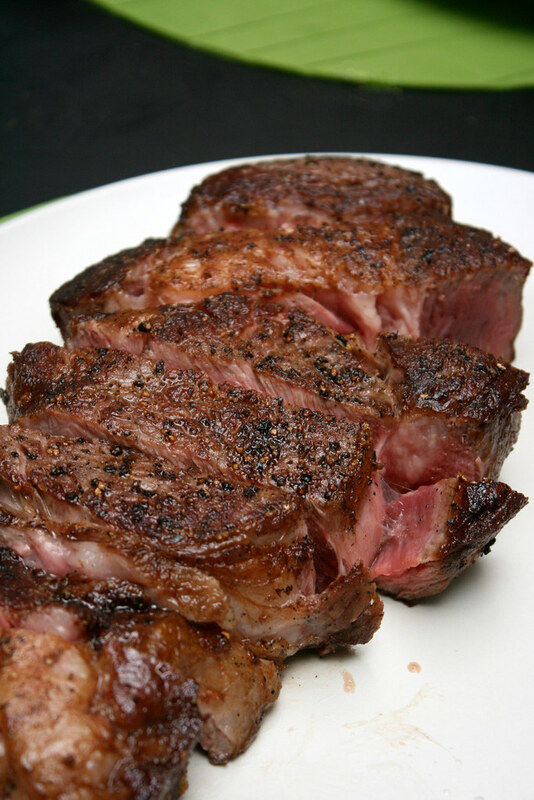 We have been there a couple of times and most of the food is competently done. This series of photos is from last September. It's the first with the DSLR but it's before I got my external flash unit. Oh how I struggled with the cosy dim lighting then! Well, next time I can enjoy the ambiance without fretting about lighting! 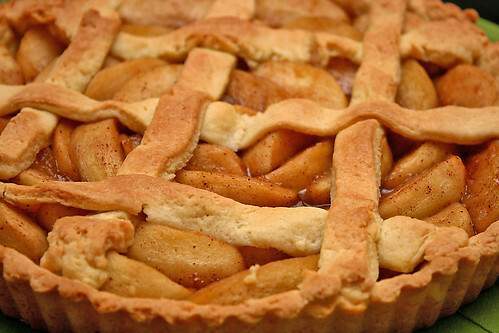 Have you ever noticed how good cooks and good bakers are often mutually exclusive? There's that rare breed that excels at both, but usually, one is good at either cooking or baking. Not both. Baking requires such precision that even the smallest deviation can result in failure, whereas cooking is much more forgiving. Occasionally I have beginner's luck with baking, which is like finding a great casino bonus. But there's no magic and certainly no luck involved...it's simply because we pay much more attention doing things the first time around. It helps not to be complacent the subsequent times you try the same recipe. Well, this is a reminder for myself! I have so many kitchen tools, I really should not add more. But I'm always tempted to get more baking equipment in the hopes that it will perhaps make me a better baker. The same thing goes for cookbooks. How I love collecting books with glorious photos of baked goods in them. But actually attempting the recipes...well, sometimes even reading the steps gets me mentally tired. Baking is sometimes just too weird and too involved. But when I do get good results, the elation is a lot more intense! And with baked goods, somehow the family tends to respond with greater appreciation! Cookies, muffins, cakes, breads and pies...it seems they can taste it's baked with love. That joy is priceless and reward in itself. It's better than winning at online slots, I'll say! That's why no matter how often I fail at baking, I will keep trying. Besides, I always learn something whenever I fail, not just when I succeed. Like who would have thought you could lose so much water through evaporation when you mix cocoa powder with hot water if you leave it uncovered as you go about the other steps in baking. I'll remember that when I next bake anything with chocolate or cocoa in it. December is often the month of merry feasting. 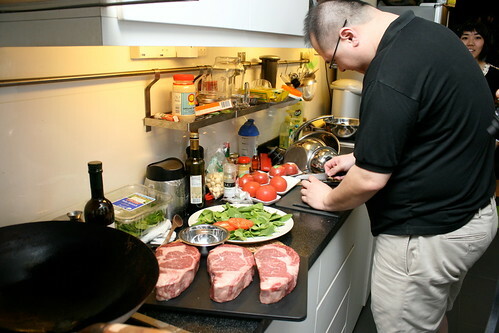 One of the best dinner parties I had was at Ivan's, who kindly invited fellow food bloggers Brad, Cheryl, Leroy and Yixiao for a steak feast. We were in for a treat! Cos if anyone knows his steak, it's Ivan! 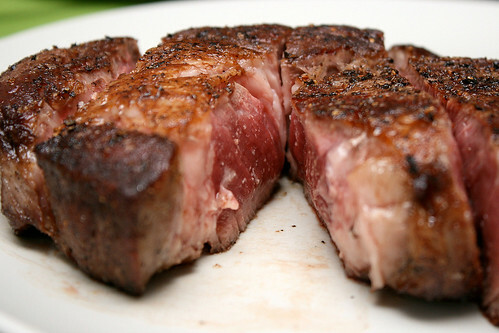 Here you go... 21-day dry-aged ribeye beauties, each weighing in at 800 grams! We proceeded first with a delightful tomato salad. Normally, I'm not a fan of tomatoes but I couldn't get enough of these sweet, firm and juicy Momotaro. The Dijon vinaigrette made it all come together beautifully. This was followed by braised oxtail stew in red wine jus. Delicious! 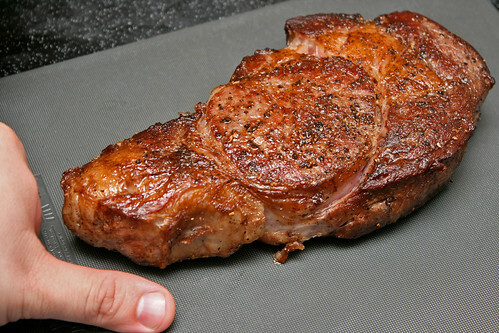 The meat was fall-off-the-bone tender. Ivan felt he didn't put enough red wine into this, but I was feeling the wine effect more from the soup than from my glass! We mopped up the soup with lots of baguette. 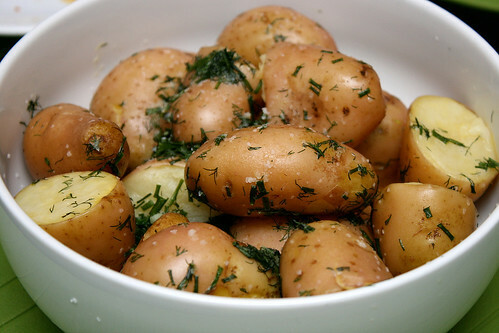 Baby potatoes in herbed butter. We wolfed this down as well, and almost forgot to keep a portion for Yixiao, who was stuck at work on the other end of the island (she missed the dinner eventually, a pity). 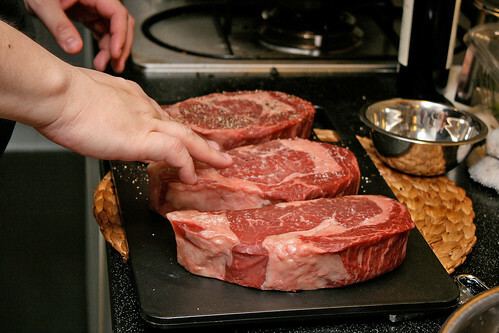 And on to the main event, the steaks. 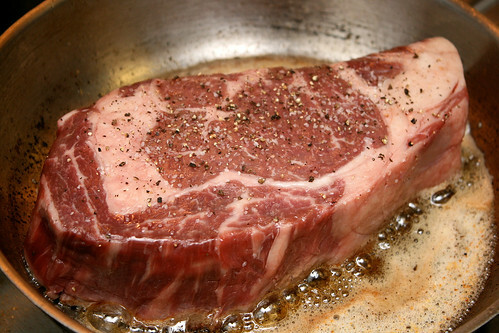 If you have good meat, salt and pepper is all you need for seasoning, just before it goes into the pan. 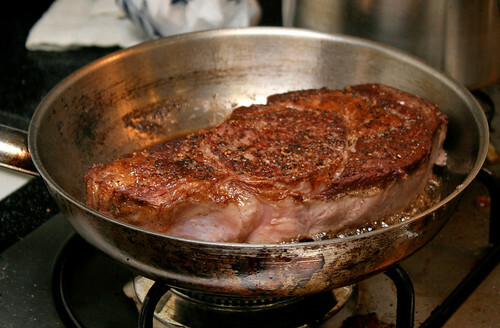 Sizzling in a good dollop of browned butter...can you smell it? Ivan is famous for his thumb shots (to show relative size). And that ain't a small thumb! Mmmh mmmhh! Would you just look at that! Beautifully rare inside. Pure beefy flavour. Amazingly clean-tasting. I loved the charred bits too. 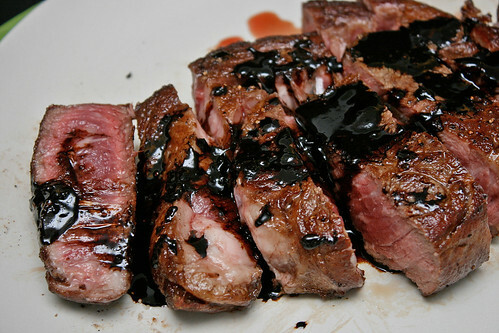 We were so excited to eat, we forgot the balsamic vinegar reduction. That just means round two! Hahaha. Yes, well, the second slab tasted even better! 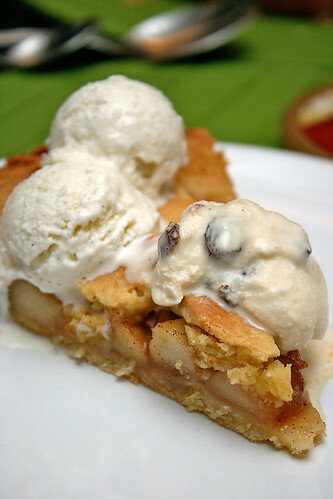 And for dessert, Cheryl baked a gorgeous apple pie! We really enjoyed this. 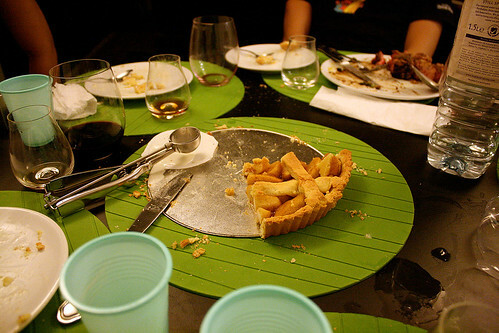 The crust was buttery perfection, and the fillings just the right balance of sweet and tart. It was a fun, laid-back evening. Ivan regaled us with travel stories, especially of Hungary where ironcially people never get hungry (food portions are apparently HUGE there). We chatted til late and even got a tour of the house! A couple of wines, including this rare, exotic dessert wine made us all very happy people. Thanks, Ivan, for a memorable dinner!